Thank Gd, our kollel has provided more than 1500 shiurim for the community over the past two years, published more than 70 issues of "Toronto Torah" to twenty shuls in the community, learned with more than 60 community chavrusos each week, uploaded more than 1000 audio shiurim to YUTorah.org and more than 100 video shiurim to koshertube.com, and so on. And all along, we have done it while representing the Torah and ideals of our parent organizations, Yeshiva University and Torah miTzion. 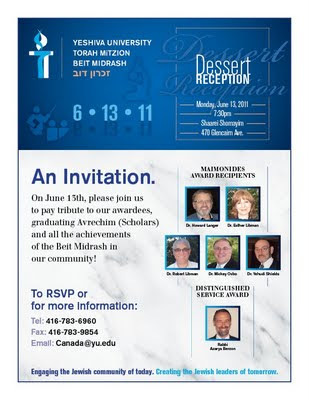 We don't charge for our Torah, but this is an opportunity to recognize what our hard-working members have done. If you are able to come, the fee is $90 per attendee. There are sponsorship opportunities available as well. This morning, toward the end of Psukei d'Zimra, I was invited to give a dvar torah during Musaf. I agreed reluctantly; I don't like to speak without planning, but I also believe it's important to take advantage of opportunities to discuss Torah. I talked about the classic description (Shabbos 88b) of HaShem holding Mount Sinai over the heads of the Jews, demanding that they accept the Torah, even though they had already volunteered that they would accept the Torah. I offered my own take: That the Jews needed a Culture of Instruction, in addition to the Culture of Volition instituted by their ancestors with their independent pursuit of Gd. Voluntary acceptance of Torah is wonderful, but it must be complemented by a feeling that the will of Gd is compulsory. The same idea applies to the gemara's assertion (Kiddushin 31a) that there is more reward for fulfilling a mitzvah one has been commanded to do, than in fulfilling a mitzvah one has accepted voluntarily. Certainly, there are several explanations for this idea, but one may be that the Culture of Instruction is critical to service of Gd. Someone who serves Gd voluntarily, because the ideology resonates with her or because the mitzvos make sense to her, might well reject some particular philosophical point or practical commandment. Volition is wonderful for its elevated use of Free Will, but it must be supplemented with Instruction. This connects with the end of Parshat Bamidbar (4:19) as well, in which we are told that each Levi was assigned a particular task in taking care of the Mishkan. Sforno comments there that no Levite could rush ahead and take a job based on wanting to do it; each person was given his role. To me, that's part of the same idea; although certain jobs were, indeed, up for those who volunteered, the Culture of Instruction was part of the Mishkan as well. This afternoon, someone approached me in shul to tell me about a contrasting idea found in an article in today's National Post: Not a Textbook Education talks about "unschooling", or the idea of having children learn through day-to-day life activities rather than through studying required texts. I know little about the field; from the article, it sounds like children are given a lot of latitude, living an unregimented day, and are exposed to different subjects on some level. They then choose what to pursue, and how to pursue it. I don't know just how extreme this is in practice, so I can't comment on the system. Is it truly open-ended? If a child says, "I don't want to learn how to multiply," or, "I'm not interested in understanding civics", is he left to use a calculator and ignore the political process? If so, I'd be pretty uncomfortable; I do think the Torah's Culture of Instruction is needed, because ignorance of certain fields will make a person a poor citizen. On the other hand, any parent could tell you that an extreme Culture of Instruction could be just as bad for a child; stifling creativity, mandating a system in which Volition is worthless, will get us nowhere. So that's what's on my mind this evening. "Our children need not forego the benefits of a worthwhile secular education; they need not sacrifice the opportunities for the study of the arts and sciences in order to obtain all the treasures of truth and wisdom that Judaism holds for their lives. If both studies are nurtured hand in hand, there will be ample room for both; the one will reinforce the other and the result will be a Jewish education that will find favor in the eyes of both Gd and man." Of course, Rav Hirsch has much more to say in this essay - on the value of secular education, on choosing Jewish education if you can only do one, on the way that secular education can help create a stronger Jew. I only excerpted this because it was quick to re-type (Rav Hirsch's style of expression generally doesn't lend itself to tweeting! ), and thought-provoking. Do you know which shul employee is the most important? It’s not the custodial staff. It’s not the caterer or the Kiddush Krew. It’s not the executive director. It might be the rabbi, but not necessarily. The most important shul employee is often the secretary, or administrative assistant, or office manager. Of course, importance can mean a lot of different things. The secretary doesn’t run davening, teach classes, raise tzedakah, balance the books, help new families settle or coordinate Chesed - but without the secretary, none of those things could run smoothly. More, the shul can't grow without a good secretary. If the secretary answers the phone and her disinterested tone of voice says, “Temple-We-Don’t-Want-Your-Call, how must I begrudgingly help you,” that’s a turn-off for the caller. If a potential new family calls the shul and receives that kind of treatment, this introduction may well be their last contact with the shul. How common is this turn-off phenomenon? I once experimented by contacting a few different shuls, and reached bored voices and robotic voicemail messages more often than not. I anonymously emailed several different shuls to ask about joining their email list before I moved to Toronto, mentioning that I might be moving to their area in the next several months. I was stunned - none of the rabbis of these synagogues, and none of their hospitality volunteers, followed up to ask about helping me get settled. A good secretary feels invested in the shul’s growth, and so she answers the phone enthusiastically, addresses people warmly and conveys information to the rabbi or appropriate others for follow-up. It’s no more than any successful business would do. Have a question about your bill? Call the office - where you will first speak to the secretary. Looking for a dues abatement? Want to sign up for a Shabbos dinner? Would you like to send a donation card in honor of someone’s baby? Speak to the secretary, speak to the secretary, speak to the secretary. In all of these cases, the secretary needs to be courteous and friendly - and smart. It’s after the sign-up deadline, but the secretary can decide whether to accept the RSVP anyway. This family wants a dues abatement - the secretary can send them to the friendly Finance person or the unfriendly Finance person. Someone sends a Mazal Tov card - a good secretary informs the rabbi of the happy occasion, in case he isn’t aware. A good secretary knows thinks about the extra step she can take, the better to help all concerned. She cares about the people with whom she interacts. But most of all [to me], the secretary is the rabbi’s best friend. The secretary catches the rabbi when he schedules a class opposite an event. The secretary finds typos in the mailing and corrects them. The secretary copies flyers and source sheets for classes. The secretary reminds the rabbi to start planning for the Simchas Beis haShoevah or Chanukah dinner, or to arrange custodial help for the Shabbos dinner. The secretary compensates for the rabbi’s mistakes. If the rabbi is late for a meeting, the secretary explains that he’s been very busy, and he’ll certainly be there momentarily - even as she calls his cell phone to make sure he’s not just napping. If the rabbi leaves the office early and someone calls looking for him, she knows where they can find him. A good secretary forms a partnership with the rabbi, and they each look out for each other. So, yes, I consider the secretary the most important shul employee. If you have a good one, give her a raise. If you don’t have a good one, get one. Your community, external and internal, as well your rabbi will thank you for it. For every problem, there is a simple solution, as there has always been - Throw the Jew down the well, then have a party. Having now read CNN's positive summary and reivew of the president's Sunday speech at AIPAC, as well as the JTA's takeaways, I do understand his explanation: That he believes this is in Israel's long-term, global interests, and that he wants to see mutually agreed-upon land swaps. Feel free to add your own verses in the comments... I only wish the Republican Party would put up a decent opposition candidate. Welcome to Haveil Havalim #317, the Lag ba'Omer edition! For those who saw the original title: I changed it because I don't want to let the CEO of Canada South hijack this week's Haveil Havalim. He'll get his due with an entire section in the posts below, but that's it. Founded by Soccer Dad, Haveil Havalim is a carnival of Jewish blogs -- a weekly collection of Jewish and Israeli blog highlights, tidbits and points of interest collected from blogs all around the world. It's hosted by different bloggers each week and coordinated by the formidable Jack And as usual, I include all posts submitted, regardless of my personal opinion on their contents, and I added some from my own browsing. Rabbi Daniel Rapp writes movingly about a mentor in Learning from Rabbi Dr. Aaron Levine at Hirhurim. Jacob Richman offers a guide to Educational websites about Lag Ba'Omer, and Rafi has a piece on Rav Shteinman's psak on Lag ba'Omer in Meron at Life in Israel. Is Lag ba’Omer really Saturday night-Sunday? Check out Harry’s Lag b’Omer is Saturday night. Or maybe not. And Our Shiputzim talks about the real Iyar Challenge“. My favorite critique is here, at Andrew Breitbart’s Big Hollywood: Gene Simmons Slams President Obama’s Israel Policy. And perhaps the Arab world didn’t like it either, says Elder of Ziyon. Cosmic X goes point-by-point with The Obama Plan Not Grounded in Middle East Reality, and Yip Bop adds With Friends Like These, Who Needs Friends? - News Beyond News!. Joe-Settler puts it simply: Netanyahu Bibi-Slaps Obama, at the Muqata, while Eric looks at recent history of US-Israel relations in The Democrats and Israel. ProfK offers Paraprosdokians to lighten the day at Conversations in Klal. Kindred Spirit writes personally and powerfully in Leap of Faith, and Mystery Woman details an important parenting lesson in Letting Go. Frume Sarah talks about her mother and smoking in Ongoing, while Rickismom talks pottery and relationships in In a Split Second, and Elle waxes poetic about her impending move in sentimental me. Kosher Beers reviews Shiner Double Wheat 102. Yum. I think? Schvach talks aging and Bob Dylan in AARP as History. Harry talks about an odd baby-name chosen in Israel, in Do you like Like? Harry has an interesting retrospective on Kupat Cholim in Nostalgia Sunday – 100 Years of Healthcare. Nakba while still on the agenda, as Ben-Yehudah offered a Nakba النكبة Day Wrap-Up! and Batya presented The Most Dangerous Ramification of Yesterday's “Nakba” Riots and Invasion. This while Cosmic X compares Nakba Day and V-E Day in The Super Nakba is Coming. Daniela reviews Osem's Pizza Ketchup and Milka's Milkinis Chocolate. Batya presents A Georgraphical History of Israel, This Neck of the Middle East. A Walker in Jerusalem presents Walls and values. Maybe she could go for a long walk with Batya. Or they could just take the train, since Batya’s Getting Impatient. Joel Katz talks religion, politics and more in Religion and State in Israel - May 16, 2011 (Section 1) and Religion and State in Israel - May 16, 2011 (Section 2). I learned quite a bit when I asked, Who owns the Holocaust – Israel or the Diaspora? And you’re probably not thinking about Shemitah at the moment, but the wondrous Menachem Butler offers Shemitta; (How) to observe, or not at the Michtavim blog. R’ Gil Student discusses justifications for dishonesty in Abortion and Deception, at Hirhurim. Josh Waxman describes a confluence of Evangelical and Kabbalistic predictons of the end of the world, in The world ends tomorrow, the day before Lag BaOmer. Chaviva is running an interesting survey with The Tzniut Project, and Risa offers her response at Hair we go again!. Rabbi Yehoishophot Oliver presents Learning Torah with humility, and also talks Pesach Sheni and second chances at Pesach Sheni: A second chance. For more on Pesach Sheni and Second Chances, check out Once again, with feeling! at Ki Yachol Nuchal. I offered a suggestion for shul’s looking for help collecting a minyan, in Come to minyan, get a free batting helmet. Susan Barnes makes a few points about labels and self-labels in Why the Current Use of the Term “Torah Jew” is a Chilul Hashem. Josh Waxman takes on Reader Response -- Is it good to debunk Torah Codes?. Leah-Perl Shollar inveighs on the definition of “melachah” in Lawsuit Over Jews’ Shabbos House: Work and Rest. Finally, Chaviva is raising funds, and along with it sharing an interesting story, at Saving a Sefer Torah. And that’s it for this week; tune in next time at Frume Sarah for Haveil Havalim #305! And in case Blog Carnival is back up and running, submit your posts here. This Shabbos I'm starting a new series, on "Parenting from the Torah". We'll be looking at advice from Tanach, midrash, gemara and later authorities on some of the big issues we face today. Our first class will be on parenting "needier" children. Specifically, we'll look at two questions: (1) How do we treat a child's special needs without undermining his self-confidence? (2) How do we treat a child's special needs without causing jealousy from his siblings? 4. Siblings will be emphathetic and understanding if their relationships with each other are strengthened. Parenting is not a canned activity. It is not something that even the best-programmed robot could do. Parenting consists of creating a relationship with a child and connecting with him in a deep and harmonious way. Raise the boy according to the course his life will take when he is grown; then he will not depart from it even in his old age. The fact that the maxim חנוך לנער על פי דרכו directs our attention separately to each individual child whose education has been entrusted to us, and bids us raise each of our children according to the future course of his life, should make us mindful of yet another reflection that is no less worthy of our consideration: Every child must be raised as an individual… The practical means by which we are to guide each individual child to this height of pure devotion to duty are not the same. They are as different from one another as the tendencies and abilities, the temperaments and proclivities, the intellectual and emotional potential are in each individual personality. Every shoe does not fit all feet. The objective of our educational work should be to raise children as different as Jacob and Esau in such a manner that both of them will grow up to be good and capable men. But if this purpose is to be achieved, the two cannot be raised by the same method. קטן שאינו צריך לאמו [חייב בסוכה] היכי דמי קטן שאינו צריך לאמו? אמרי דבי רבי ינאי כל שנפנה ואין אמו מקנחתו רבי שמעון בן לקיש אומר כל שנעור משנתו ואינו קורא אמא. גדולים נמי קרו! אלא כל שנעור ואינו קורא אמא אמא. Certainly, they are obligated in mitzvot once they reach physical maturity, at the age of 12 or 13, and there is an obligation upon their parents to teach them whatever is possible from the time they are still minors. This is not at the age of six, as it is obligatory for other children, but rather at the time when each parent sees that his child may learn with him. And it was, at the end of days, Kayin brought a gift to Gd from the fruit of the land. And Hevel also brought from the first of his sheep, and their fat. And Gd turned to Hevel and to his offering. Medication does not do homework, medication does not practice the new pasukim, and medication does not read the chapter in social studies. It is they who do the learning, who practice their new assignments, who do the homework and who organize and plan their time and tasks in a better fashion. ‘And he was a youth with the children of Bilhah…’ His youth and his habits and his drinking were with the children of Bilhah and Zilpah, and so his brothers, children of Leah, began to hate him. ‘He gave to all of them, to each he gave changes of clothes, and to Binyamin he gave five changes of clothes’ – Can it be that the righteous one who was pained in this manner would now stumble in the same thing? For Rava bar Machsiya said that because of the two measures of silk which Yaakov added for Yosef over his brothers, the matter developed and our ancestors descended to Egypt! Come to minyan, get a free batting helmet! In my 12 years in the pulpit, I served in two shuls, both of which went through times when we had difficulty ensuring our minyan. Certain times of year were harder than others – early winter afternoons for minchah/maariv, post-Succos and post-Pesach for Shacharis as men needed to make up for time taken off from work – and then other times were challenging because we needed to provide minyanim for shivah houses as well. ...scheduling teen programming so that they would be in shul at the time we needed them. Some suggested providing post-minyan food and drink, newspapers to read in a lounge before or after minyan, and so on. Some wanted to give dues discounts for those who supported the shul by coming to minyan. No different from what many shuls do. It was hard, and draining. Spending time – sometimes daily, in my first shul – calling or emailing people to ask them to stop into shul for 35 minutes, for their own mitzvah, can really sap a rabbi’s energy. Here the rabbi is, spending his entire day and much of his night looking after the needs of individuals and institutions, and people can’t be bothered to help out the community, if not themselves, by coming to shul? The daily grind of it can really wear. But here’s a thought I never tried: Imitate the strategy Bill Veeck pioneered in baseball, and create special Days or Nights appealing to special segments of the population. Perhaps there could also be sponsored giveaways, modeled on ballpark giveaways. And then there are the days and nights dedicated to attracting a specific segment of the population: Children’s day, Ladies’ day, Star Trek night, Singles night, Legal Professionals night, Indian Heritage night, Irish Heritage night, Chinese Heritage night, Jewish Heritage night, Scout day and so on. So why not do the same in shul? There could be giveaways, sponsored by local businesses – books, sports memorabilia, trinkets, office supplies, etc. And, perhaps better, there could be minyanim targeting specific segments of the population, with programming attached to suit their needs. Accountants Night, with a brief shiur, or even a secular class, on taxes. Children’s Day, of course, perhaps split up by grades. Lawyers, Physicians, Singles, New Yorkers, Hockey fans, and so on. Sure, this would be a lot of work to set up, initially, but once you have a portfolio of 30-50 ideas, it’s fairly easy to run through them repeatedly, and people might actually enjoy it. Perhaps this could be done for one particular weekday - Tuesdays, for example - as a test of its appeal. I’m glad I’m no longer responsible to ensure there is a daily minyan, but I think this could be fun. Jewish Email Etiquette: Say Hello! R’ Matya ben Charash said: Greet everyone with ‘Shalom’ first. One should even greet a wicked person with ‘Shalom’ first, for otherwise the wicked person – who does not consider himself wicked – will think that he degrades Gd’s creations. ‘And he bowed and kissed him.’ I can’t tell who bowed to whom or who kissed whom, but then it says, ‘The ish asked after the other’s peace,’ and Moshe is the one called ish… So Moshe was the one who bowed and kissed his father-in-law, teaching one should always be prepared to honor his father-in-law. If one knows that another person regularly greets him, he should greet that person first, as it is written, ‘Seek peace and pursue it.’ And if the other greets him and he does not reply, he is labelled a thief. Who owns the Holocaust – Israel, or the Diaspora? I’ve been thinking about the triangular relationship between Israelis, Diaspora Jewry, and the Holocaust. That relationship has been emotionally fraught since the beginning; Israelis and Diaspora Jews have seen the Holocaust in fundamentally different ways since the war itself. For example, the latter tend to emphasize the suffering while the former emphasize the Jews who fought back, as well as the imperative to build a state which can defend itself. For the past sixty-five years, in part due to the fact that the majority of survivors lived outside of Israel, Diaspora Jews have dominated the Holocaust narrative. Despite the presence of Yad VaShem, the world’s leading Holocaust memorial, in Israel, it has still seemed – based on news media, published literature, academic studies and conferences – that the Holocaust’s heirs, if you will, were the Jews around the world. 1. An Israeli friend pointed out to me that Israelis postponed this year’s Yom haShoah commemoration from the 27th of Nisan (a Sunday) to the following day, to avoid violation of Shabbat in the evening’s ceremonies. He was upset that much of the Diaspora did not follow Israel’s lead. To me, this was surprising; unlike Yom ha’Atzmaut or Yom Yerushalayim, there is nothing inherently Israeli about Yom haShoah. (The concern for Shabbat violation in holding ceremonies on Saturday night was not relevant, either; faced with a Sunday Yom haShoah in lands where Sunday is a day off, communities tend to use Sunday for their Yom haShoah programs.) So why should world Jewry follow the Chief Rabbinate’s decision on marking this day? But to him, and I suspect to many Israelis, it was obviously the correct thing to do. 2. When John Demjanjuk was convicted this week in a German court for his role in the Nazi genocide, local radio went looking for Jewish reaction not in Jewish Toronto, or even at the Simon Wiesenthal Center, but instead in “man on the street” interviews in Israel. I think one reason for this shift is the passing of so much of the Survivor generation. As those who witnessed it personally disappear, there is less reason for their Diaspora communities to represent the Jews who were lost. But more, I think it’s because of a growing clarity that the only viable Jewish community in the world, long-term, is Israel. As powerful Jewish communities in Galut shrink, there is decreasing reason to consult them on “Jewish matters”. How long does it take to become a Rabbi? The other day, a comment from a friend caused me to calculate just how much time rabbis spend in training for the halachic component of the rabbinate. Without any particular goal in mind, while sitting on a plane, I did the math: Aside from pastoral, administrative, or communal training, aside from studies of Hebrew language, Chumash, Navi, Jewish History, homiletics and so on… how much time do rabbis spend on learning either law, or legal theory, in Talmud or Halachah classes? Of course, the answer will vary by program. I understand that there are 1-year rabbinic training programs. I also know that certain yeshivot grant automatic ordination when their kollel students get married. And then, of course, there are ‘partial ordination’ programs in which students specialize in specific areas of law, for which they are tested and for which they receive certificates. So I’ll take a student who follows a course of study with which I am familiar: Day school, followed by Modern Orthodox high school, followed by Yeshiva University, two years in Israel, and semichah studies at RIETS-Yeshiva University. As a general rule, day schools have their students – sometimes boys and girls, sometimes just boys – begin to study mishnah and gemara in 5th or 6th grade. Let’s say it’s 6th grade. They generally spend 40 minutes each day for the first year, for which I’ll assume 180 curricular days. So that’s 120 hours. For 7th and 8th grade it’s more intense, more like 90 minutes each day. Continuing with 180 days each year, that’s 540 more hours, for a total of 660 hours. Then high school. As I recall, we spent 3.5 hours each day in gemara and halachah at MTA. Again, I’ll allow 180 days. Over a four year high school career, that’s 2520 more hours, for a total of 3180 hours by the time he graduates high school. Our student then goes off to Israel, where he studies for two years. For five days each week he studies gemara and halachah for at least 8 hours per day, and in certain yeshivot more like 10-12 hours per day. But let’s go with 8 hours per day during the week for 200 days each year, and then 6 hours on each Friday-Shabbos combination for 40 weeks. That’s really undercutting it, but it yields 1840 hours each year, 3680 total [again, minus summers], for a lifetime total of 6860 hours spent in studying gemara and halachah. Not all of these studies are at the same level, of course; in 6th grade he’s getting an introduction. In 7th-8th he learns about Rashi and Tosafot on some level. In high school he studies Rishonim, and to a certain extent he is introduced to Acharonim. In Israel he may learn Acharonim in greater depth. But it’s 6860 hours, before he has even entered college. At YU’s Mazer Yeshiva Program, he studies gemara and halachah for 4 hours each day as part of the curriculuum, and another 2 hours each night, and let’s assume 180 days per year. Again, we discount outside studies, Sundays, summers. But for 3 years in college, that yields another 3240 hours. Total of 10,100 hours lifetime. Then he enters the semichah program, and he learns 8 hours each day, 180 days per year, for 3 years, for a total of 4320 hours. Again, this is undercounting because of summers and Sundays, and it undercounts the numbers per day, but it’ll have to do. Total of 14,420 hours lifetime, before receiving semichah. By comparison – someone who attends a full daf yomi cycle, hearing 1 hour of shiur per day (as opposed to our 35 minutes here! ), spends about 2707 hours. This is more than 5 times that number. And it’s only the beginning; a rabbi who stops learning when he enters the rabbinate will soon find himself out of his depth. That’s an awfully long time to spend on this, much more than I think necessary for a person who is not entering the rabbinate. For a non-rabbi, I think the time could be better spent on other parts of Torah. Further, one could give educational classes and write articulate articles and give inspiring speeches without all of this study. It’s not particularly hard for an experienced student to tackle a new topic by reading a few existing articles, digesting and organizing the information and finding a good way to present it. I've been told by Conservative and Reform colleagues that this time is unnecessary, that primary sources can be summed up by secondary and tertiary sources, later articles presenting a digest of learning and views. But I do think this amount of time is necessary if one is to be serious about learning and teaching on a deep level, let alone answering halachic questions. Accepting someone's digest means sacrificing the possibility of personal investigation, and the depth of understanding that comes with that investigation. And it means that when new questions come up, one flounders for a way to address them. The time is necessary. As I said, I don’t really have a goal or conclusion here. Just thoughts on a plane. Long before the United Nations’ vote of November 1947 and David Ben Gurion’s declaration of the following May, much of the Torah-observant Jewish world was skeptical regarding the significance of a secular Jewish state. Could “secular Jewish” be anything other than an oxymoron? How would Judaism fare under a government composed of people who were often indifferent to religious law? And, as with every other entity in the known universe, the ultimate question was asked: Would it be good for the Jews? Even Rabbi Avraham Yitzchak haKohen Kook, champion of religious-secular cooperation, insisted upon the ultimate religious character of the State he envisioned. As an alternative to the HaTikvah anthem, with its hope “lihyot am chofshi b’artzeinu, to be a free people in our land,” Rav Kook composed HaEmunah, a song which dreamed “lashuv el eretz kodsheinu, to return to our holy land.” Rav Kook believed that secular administration could contribute toward the ultimate rejuvenation of the Jewish nation in its land, but would be nothing more than an interim stage in the journey toward our national destiny. This rejection of secular government has led some to argue that Yom ha’Atzmaut, the anniversary of the establishment of that secular government in Israel, is not to be accepted as a religious holiday. However, the weight of Jewish tradition insists that despite its secular character, the fact of independence - the ability of Jews to live in, develop and govern the land of Israel - is worthy of religious celebration and gratitude to G-d. There are at least three reasons for this celebration. First, we celebrate our independence for the safety it brings; not for millenia has the viability of the Jewish nation seemed so strong. While the theory that creation of a Jewish state would eliminate anti-Semitism has proved incorrect, Jews living on their own soil are still best suited to defend themselves. The pogroms of Kishinev, the Inquisitions of Europe and the Klansmen of North America are impotent ghosts to a country with a Jewish majority. Second, we celebrate the opportunity to dwell within our own boundaries, as a majority, and so evolve a true Jewish identity as a community. As much as our globalized culture and economy have rendered borders porous, neither Internet meme nor multimedia fad can trump the card of physical proximity in shaping the independent identity of a community. A contiguous nation develops its own memes and fads, and on a deeper level its own morals and ideals, via the vectors of neighborhood, school, workplace and shared experience. The Torah itself declares the importance of physical separation for our evolution; one of the messages sent to the Jewish people via the prophet Balaam (Numbers 23) blessed them as “am l’vadad yishkon, a nation that dwells alone.” The sages sought to encourage this separation, enacting dietary laws as well as Shabbat restrictions which would encourage Jews to occupy unique physical space. This vision of separate community is not a philosophy of chauvinistic denigration of the other, or xenophobia, but a positive wish for physical and social space in which to evolve an identity of our own. As Asher Ginsberg, a.k.a. Ahad Ha’Am, wrote in 1909, “A complete national life involves two things: first, full play for the creative faculties of the nation in a specific national culture of its own, and, second, a system of education whereby the individual members of the nation will be thoroughly imbued with that culture, and so molded by it that its imprint will be recognizable in all their way of life and thought, individual and social.” Certainly, Ginsberg’s vision of a “specific national culture” did not include religion – but the principle applies to any attempt to mold a nation’s identity, and so the opportunity to occupy our own space and reap the religious benefits is cause for worshipful gratitude. Certainly, we have many more reasons to be grateful the return of Jews to Israel. Many thousands of Jews live Torah-observant lives, and even spend their days in Torah study (often funded by the Israeli government, the single-largest sponsor of Torah study in the world) in Israel. The land of Israel provides an on-going resource for renewed Jewish identity for thousands of Jewish teens each year. Many mitzvot can be fulfilled only in Israel. But regarding the specific question of whether a religious Jew can celebrate the founding of a secular state, these three reasons – safety, community and the opportunity to develop the Land of Israel – make Yom ha’Atzmaut, Israel’s Independence Day, a day for every Torah-observant Jew to rejoice. Sorry, but I lack the interest in posting these days. Between the heavy feel of this coming Yom haZikaron, and the fact that I will board a plane in a few minutes to go be with friends who are mourning a horrific loss, I just don't have it. Before my reserve duty, I picked up a small 2 volume set of books by Rav Yosef Tzvi Rimon, that discusses Jewish observance issues in the IDF. Over Shabbat I had the opportunity to read part of it, and I found this story particularly meaningful. Rav Rimon quotes a story from Chief Rabbi Lau’s book, “Light of the World” (Oro shel Olam), page 380, and Rav Rimon says he also heard the same story from many other people as well. The student replied, “Isn’t there a time I could go to visit the graves of tzadikim? Doesn’t Rav Auerbach go and pray by the graves of tzadikim? This Yom Hazikaron, Israel Memorial Day, I urge you to take a few minutes to honor the memory of the brave IDF soldiers who fell in battle in the creation and ongoing struggle for the safety and security of the State of Israel. There are also many, many wounded soldiers and victims of Arab Terror who are also remembered on this day…and we need to remember them and their families. Here are the vignettes, and the source sheets. 1. Carl, a family physician, treated the mother and uncle of 22-year old James for manic depression. James is dating a girl seriously, and Carl knows her family. Is Carl able or obligated to inform the girl, or her parents? 2. Dana, an OB-GYN, is informed by her patient, 25-year old Jane, that she contracted an STD in the course of an extramarital affair. If this is true, Jane’s husband is required by Jewish law to divorce her. Does Dana have an obligation to inform Jane’s husband? לפני עור לא תתן מכשול and לא תעמוד על דם רעך: Inaction vs. action? What if I was not asked? What about “harm” which most people would not consider “harm” at all? כל היכול להציל ולא הציל עובר על +ויקרא י"ט ט"ז+ לא תעמוד על דם רעך, וכן הרואה את חבירו טובע בים או ליסטים באים עליו או חיה רעה באה עליו... או ששמע גוים או מוסרים מחשבים עליו רעה או טומנין לו פח ולא גלה אוזן חבירו והודיעו, או שידע בגוי או באנס שהוא קובל על חבירו ויכול לפייסו בגלל חבירו ולהסיר מה שבלבו ולא פייסו, וכל כיוצא בדברים אלו, העושה אותם עובר על לא תעמוד על דם רעך. והמצוה הרצ"ז היא שהזהירנו מהתרשל בהצלת נפש אחד מישראל כשנראהו בסכנת המות או ההפסד ויהיה לנו יכולת להצילו. כמו שיהיה טובע במים ואנחנו נדע לשחות ונוכל להצילו. או יהיה גוי משתדל להרגו ואנחנו נוכל לבטל מחשבתו או לדחות ממנו נזקו. לא יכסה אדם מום בני ביתו, אם צריכים בניו או קרוביו להזדווג אם יש להם חולי שאלו היו יודעים אותם המזדווגים עמהם אותו חולי לא היו מזדווגים יגלה להם, פן יאמרו קדושי טעות היו. אלא יפרידם ולא יהיו ברע יחדיו. או אם יש מעשים רעים להם שאלו היו יודעים לא היו מתחתנים בהם לכך יפרסם. וכן לענין צדקה שאם היו יודעים לא היו נותנים להם הרבה יגיד לנותנים. Doesn’t כבוד הבריות override certain prohibitions? Couldn’t we argue that what he doesn’t know won’t hurt him? What if secular law prohibits telling? הרואה כלאים של תורה על חבירו, אפילו היה מהלך בשוק, היה קופץ לו וקורעו מעליו מיד, ואפילו היה רבו. (וי"א דאם היה הלובש שוגג, אין צריך לעשות בשוק, דמשום כבוד הבריות ישתוק, ואל יפרישנו משוגג) (טור בשם הרא"ש). יח. תוספות מסכת כתובות דף ט עמוד א "ומי"
לא קינא לה, ובא עד א' ואמר לה: זינתה, והיא שותקת, אם הוא נאמן בעיניו ודעתו סומכת עליו כשנים, יוציא ויתן כתובה; ואם לאו, מותרת לו. הגה: והוא הדין אם היא עצמה אומרת לו שזנתה... וי"א דבזמן הזה שיש חרם ר"ג שלא לגרש אשה בעל כרחה, אינו נאמן לומר שמאמינה או שמאמין לדברי העד, דחיישינן שמא עיניו נתן באחרת, ואומר שמאמינה אע"פ שאינו מאמין. ומנדין אותו על שאומר שמאמינה וגרם לבטל חרם ר"ג [לגרשה בעל כרחה]. והוא הדין בכל מקום שלא יוכל לגרש בלא דעת האשה. Roger Neilson says: Count the Weeks!